We (my twin brother Jason and I) did have options when we were growing up. At my earliest memories I would be excited to get a hair cut from my dad. I hope Bash has that same excitement because I plan to cut his hair. The only difference is I'm actually good at cutting hair. Dad used to jack us the hell up! And I liked it! I guess it makes sense because he was my hero and all, but damn, Dad. Where was my hair line? When I got older I started requesting that he "tape up" my hairline. Give it some frame and structure. He said he was giving us "The Natural". The Natural? That's code for: I don't know how to do what you want me to do, so go on out there and get made fun of. I didn't really get made fun of that much. But I cared about my hair when I had it. Maybe I subconsciously knew that my time with my hair was limited. I didn't want to be running around wasting my precious hair time with "The Natural". When Dad wasn't around we would go get haircuts from professional barbers. That only made "The Natural" look worse. We knew what a good haircut looked like. And what it didn't look like was "The Natural". Mom let us experiment with our hair to some extent. I was allowed to grow out a huge afro. She helped me make it the best in the school by braiding it at night and oiling my scalp so that in the morning I could take out the braids and have a nice, tender "blowout" afro to show off at school! Jason tried a lot of different things. He did the fade, afro and we both did some sick designs once. The barber was so pleased with the finished product that he asked us to come back so he could take pictures of it for his wall. We didn't make it back, unfortunately. I really wanted to model my cut. High school came around and Jason wanted to wear some braids that came from the middle of his scalp and hung over the side. It was kind of like something one of the guys from the young R&B group Immature would wear. 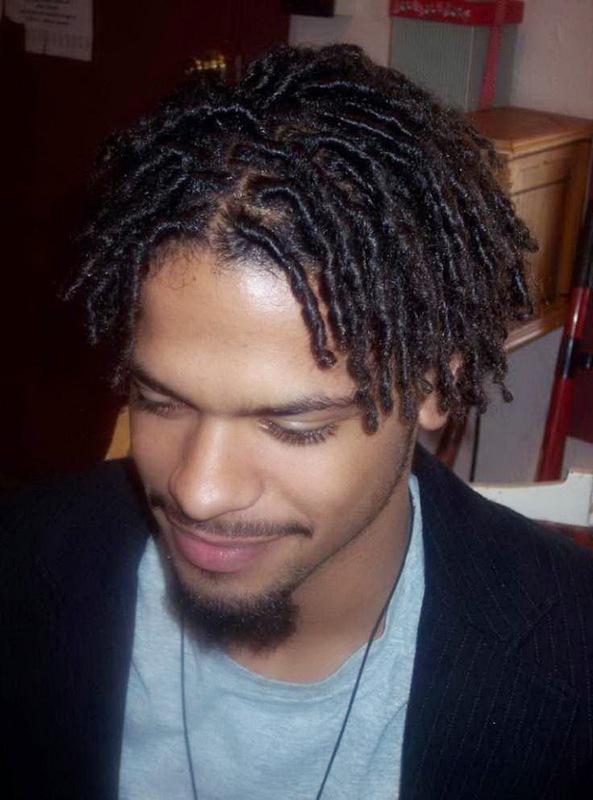 The style was kind of like what the guy has in the picture except my mom braided out from a part right down the center of the scalp. She didn't want the braids to start looking bad after a while, so she suggested Jason let her put weave extensions in his hair. Mom has always been persuasive. Jason thought it would be okay. Mom was good at putting in extensions so it wouldn't be experimental. In some ways it would be better than "The Natural". The hairdo actually looked good on Jason. He has always been a handsome guy. The braids would hold for long, too. Win-win. My grandmother got married around that time and there would be a huge reception. Jason would have his braids and me my nice afro. My aunt was dating a guy (now my uncle) and she had talked about her sister's kids a lot to him. He was eager to meet us. She told him that her sister had twins and a girl. - Damn! That's the ugliest little girl I ever seen! She looks like a damn boy! My aunt introduced us to him and a feeling of relief came over him. - Oh! I thought y'all were the twins!